Belviq is a selective serotonin 2C receptor agonist (5-HT2C) that promotes weight loss by reducing food intake. It is characterized by a high potency and selectivity for the 5-HT2C receptor, thus minimizing adverse effects associated with the 5-HT2B receptor (ie, cardiac valvulopathy and pulmonary hypertension) and the 5-HT2A receptor (ie, hallucination). Since the 1970s, pharmaceutical companies have been relishing the pharmacologic effects of serotonin in weight loss. The serotonin 5-HT2 receptor subfamily consists of 3 distinct receptor subtypes, 5-HT2A, 5-HT2B, and 5-HT2C, all of which share considerable sequence homology (>80% in transmembrane spanning regions) and activate common signaling pathways, including Gqα-mediated stimulation of phospholipase-Cβ, elevation of intracellular inositol phosphates, and elevation of intracellular calcium. been the deleterious association with hallucination from the activation of the 5-HT2A receptors and cardiac valvulopathy and pulmonary hypertension from the activation of the 5-HT2B receptors. With undesirable effects linked to the 5-HT2A and 5-HT2B receptors, the pharmaceutical industry decided to explore the remaining options in the subfamily, the 5-HT2C receptors. Human 5-HT2C receptors are predominately expressed in the central nervous system, and they are highly enriched in choroid plexus, prefrontal cortex, hippocampus, basal ganglia, and other brain regions associated with the control of mood, cognition, and appetite. From an in vivo study in 1995, Tecott et al observed that mice lacking 5-HT2C receptors developed late onset obesity along with other comorbidities when fed a high-fat diet, indicating, for the first time, a functional role for the 5-HT2C receptor in serotonergic modulation of food intake and body weight. Thus, it was only reasonable that when Arena Pharmaceuticals searched for the next weight loss blockbuster, they emphasized on the utility of the 5-HT2C receptors. Lorcaserin hydrochloride, a selective 5-HT2C agonist, is a small molecule that decreases food intake and promotes weight loss in a dose-dependent fashion via the activation of 5-HT through the pro-opiomelanocortin system of neurons, as first observed in rodents. Unlike its predecessors that target the 5-HT subfamily indiscriminately, lorcaserin exhibits a functional selectivity specifically for the 5-HT2C receptors that is approximately 15 times and 100 times higher than for the 5-HT2A and 5-HT2B receptors, respectively. This selectivity allows lorcaserin to enhance weight loss while mitigating the negative effects manifested in the nonselective serotonergic agents. Sites of action of 5-HT therapeutics: Shown in the middle is a table listing the major families of 5-HT receptors (viz. 5-HT1 to 5-HT7). As shown, the 5-HT1 family has five members (5-HT1A, 5-HT1B, 5-HT1D, 5-HT1E, and 5-HT1F), while the 5-HT2 family — the topic of this review — has three: 5-HT2A, 5-HT2B, and 5-HT2C. Each member of the 5-HT2 family displays distinct brain and tissue distributions. The 5-HT2A receptor is enriched in pyramidal neurons in layer V of the cerebral cortex, where it mediates the actions of pimavanserin and other atypical antipsychotic drugs. The 5-HT2B receptor is enriched in interstitial cells of the heart valves, where it mediates the valvulopathic actions of certain drugs like fenfluramine. The 5-HT2C receptor is enriched in the hypothalamus, among other areas, particularly in nuclei engaged in regulating feeding behavior, where it mediates the actions of the appetite suppressant lorcaserin. J Clin Invest. 2013 Dec 2;123(12):4986-91. doi: 10.1172/JCI70678. Epub 2013 Dec 2. Lorcaserin and pimavanserin: emerging selectivity of serotonin receptor subtype-targeted drugs. Lorcaserin exhibits rapid absorption (>90%) after an oral administration. In a single-dose study with healthy volunteers, Morgan et al 28 found that at 10-, 20-, and 40-mg doses, lorcaserin projected a dose-proportional pharmacokinetic property and a dose-dependent increase in drug exposure. Metabolized in the liver and excreted through the kidney, lorcaserin undergoes extensive hepatic metabolism to several inactive metabolites. There have been 3 trials with lorcaserin, all of which have demonstrated effective weight loss compared with placebo, along with a favorable safety profile. Two of the studies evaluated the use of lorcaserin in obese patients and overweight patients with at least 1 obesity-related risk factor. The third study focused on the safety and efficacy of lorcaserin specifically in patients with type 2 diabetes mellitus. Similar side effects were observed in all 3 phase III trials for lorcaserin. The researchers found no increase in the rate of cardiac valve disease at the end of each study, and the rate of new cardiac valvulopathy did not significantly differ between the placebo and the lorcaserin groups in all 3 trials. Lorcaserin is contraindicated during pregnancy because weight loss offers no potential benefit to a pregnant woman and can cause fetal harm. Hence, administering lorcaserin during pregnancy or in women of reproductive age without preemptive pregnancy testing is not advised. 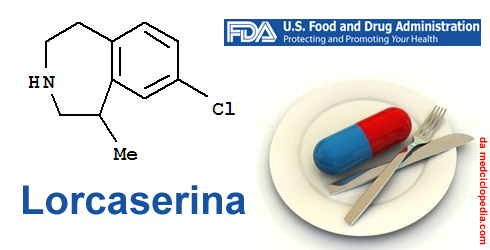 Because of its dependency and abuse potential, lorcaserin is regulated as a schedule IV controlled substance. In general, lorcaserin poses a relatively good safety profile and is well tolerated.